Fast-approaching deadlines for compliance with the EU’s new medical device and diagnostics rules. Once the new rules are in place, they will be stricter than those imposed by the U.S. FDA. Slower growth in the European medical device market as industry grapples with the complexities of the regulations and tougher requirements for notified bodies. Medical device companies are racing to prepare for a sweeping overhaul of rules governing the European medical device market, the second largest in the world after the U.S., totaling more than $124 billion in 2015. 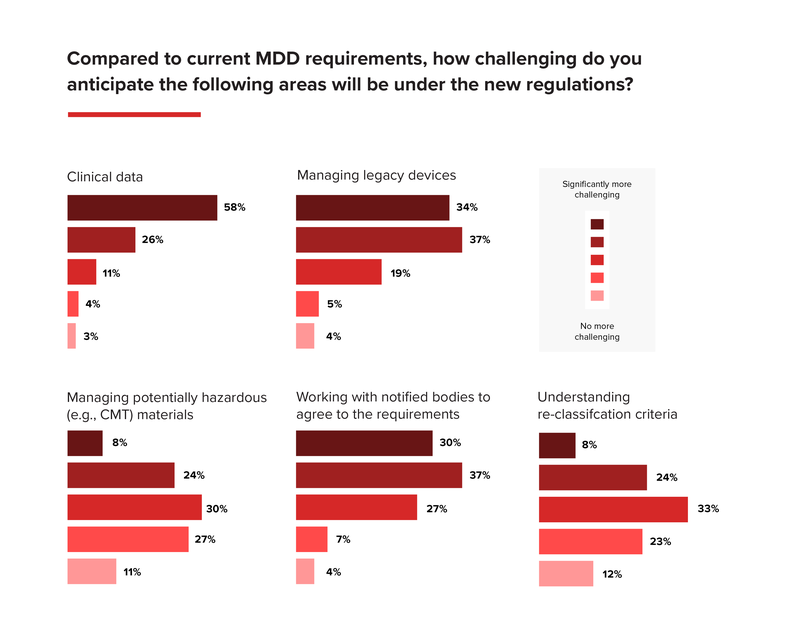 While companies anticipate growth in the coming years, uncertainties around implementation and transition to the EU’s Medical Devices Regulation and In Vitro Diagnostics Regulation have dampened expectations. Just 41% of respondents in an Emergo survey believed Europe would see strong market growth in 2018, down from 51% the previous year. "The big lady at the moment with the MDR is whether the manufacturers will have any real transition period left to implement the regulation," Erik Vollebregt, a device attorney with Axon Lawyers in the Netherlands, told MedTech Dive via email. The push for the new rules came in part amid a scandal in Europe about dodgy breast implants sold by a French company that led to a massive recall and questions about the patchwork of regulatory oversight. The MDR provides a three-year transition period to May 26, 2020, and the IVDR a five-year transition to May 26, 2022. But as the clock ticks down, much of the most basic implementation work still needs to be done, such as publishing a series of required implementing acts and designating notified bodies to the new requirements of each law. To date, the European Commission has issued just one of the 18 implementing acts required to make the new rules work. It describes the codes and corresponding device types for specifying the scope of notified body designation. Another on reprocessing of single-use devices is in public consultation. Meanwhile, many parts of the framework remain unclear, including establishment of expert panels and associated fees, structure, fees and rules regarding EU reference laboratories and designation of issuing entities for unique device identification. Other activities are also a work in progress, providing little industry guidance on how to navigate the new regulations. The Commission is still determining functional specifications for Eudamed, a databank of devices registered in the EU, and work on a promised helpdesk has yet to begin. Notwithstanding, the go-live date for Eudamed for both medical devices and IVDs is March 26. Over the ensuing 18 months, manufacturers must input data on products on the European market. Additional decisions on EU medical device nomenclature and a standardization mandate aren’t expected until the first quarter of 2019. Meanwhile, notified bodies are in the process of being re-accredited for the new rules, with the first designations not expected before the second quarter of next year. That leaves less than a year for thousands of devices to undergo conformance assessments for CE marking. With no notified bodies designated to the new rules, it’s not clear whether there will enough entities to handle the increased workload. According to NANDO, the EU’s notified body database, the number of notified bodies has dropped from about 80 to 59. A possible shortfall is especially worrisome in the IVD area where about 80% of products — an estimated 35,200 —will require notified body oversight for the first time. Meanwhile, a hard Brexit could further shrink notified body capacity for products in the EU. And the transition clock keeps ticking. The prospect of shortages of notified bodies to certify some types of devices, and a bottleneck of products seeking CE certification, has raised concerns of potential shortages and the impact on innovation. “We are concerned that this could block innovation in the EU market in the short term and have even long-term implications because if notified bodies are up for a numbers game, trying to do as many reviews as possible, the easy reviews are probably going to get done first,” Joe Gatewood, vice president of global strategy and analysis at AdvaMed, recently told MedTech Dive. 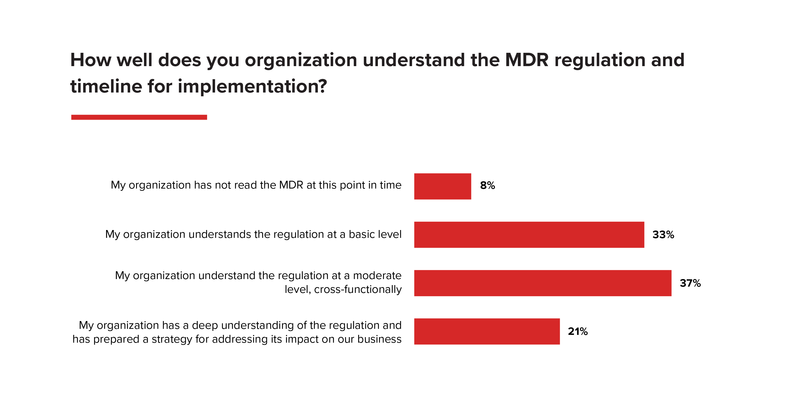 Meanwhile, nearly eight in 10 medical device companies lack sufficient understanding of the MDR legislation, according to a recent KPMG and Regulatory Affairs Professional Society survey. Nearly six in ten have no strategy for remedying gaps in their clinical data or processes for collecting data and 38% have yet to identify, define or document roles and responsibilities for a person responsible for regulatory compliance. Industry has pressed the Commission to “stop the clock” or extend the regulatory deadlines to prevent a major bottleneck of products needing review, but chances of either of those decisions are slim at best. And there is no process for grandfathering in products currently in the market.